The little bit of nerd in me, always gets diverted when I come across any new piece of technological innovation ( I surely need to do some YOGA to keep my focus) . I was between serious work, understanding YouTube Channels , when I got digressed once again into “Cinemagraphs” . I wanted to try my hands of creating one for while now, but not being any good in photography and having just the least bit of photoshop blood in me, I had told myself a few months(years) back to let it go. But today my inner nerd was nudged again :) and I ended up wasting best part of the evening trying to create one … just for “Been There Done That” status as far as Cinemagraphs are concerned …. I would like a FAST, CHEAP and GOOD Website, Please!!!! 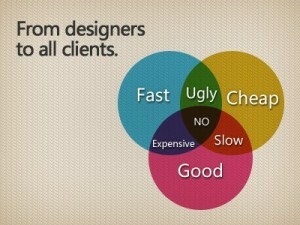 I saw this on some website … Words wont explain it better than this Union/Venn diagram. What it means in English? Good and fast work will NOT be CHEAP. Fast and cheap work will NOT be necessarily GOOD. Cheap and good work will NOT be FAST. PS: Thanks to the fellow developer who came up with this. Will be glad to put your link here!!! let me know please. Entries (RSS) and Comments (RSS).66 queries. 0.245 seconds.